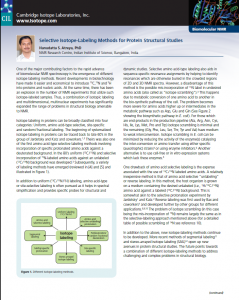 Selective labeling of a protein is used to simplify crowded spectra in order to aid in spectral interpretation or to provide specific probes for dynamic and structural studies. There are a few procedures available for selective labeling. 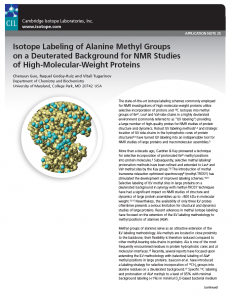 The most popular method is Amino Acid Type Selective labeling which entails the addition of one or more labeled amino acids (~50->250 mg / L) to unlabeled growth media prior to protein induction. The cells will generally utilize the supplemented amino acids for protein synthesis prior to undergoing the de novo synthesis of the target amino acids. The only labeled residues in the expressed protein will thus be the amino acid types supplemented to the medium. 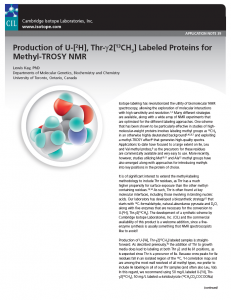 A different method, Selective Unlabeling, utilises the addition of one or more unlabeled amino acids to a labeled minimal medium. Therefore, the expressed protein will be fully labeled except for the residue types corresponding to the unlabeled amino acids that were supplemented to the minimal medium. A full listing for this product group can be found in our Stable Isotopes for Structural Biomolecular NMR catlogue. We have also listed a few helpful application notes below that me be helpful and are just generally interesting reads anyway. If you have any questions or wish to discuss your needs then please don’t hesitate to contact us.